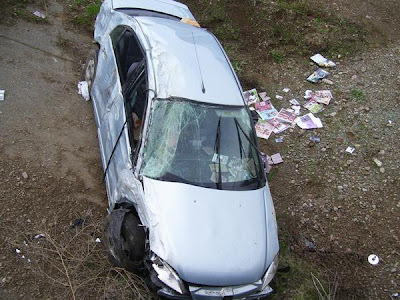 Three years ago, my friend and I walked away from this accident. Well, technically, I pulled him out of the passenger side window, but no props to me since the accident was my fault. No, I wasn't drunk... I was just tired. When I got home, I labeled this picture "luckiestmanalive.jpg" and that's how it's been listed on my computer ever since. Wherever the message came from, I got it loud and clear... "slow down." Since that morning, that's exactly what I've tried to do. Call me a nerd, but when I booked my ticket for this trip back in November 2009, there was one thing that I looked forward to more than anything else... reading. Maybe that doesn't make sense to you... why fly halfway around the world just to read? To me, it makes perfects sense. For me, reading represents the best possible way to just "slow down." Many people think of vacation as a chance to just "get away." While I definitely looked forward to "getting away" from home, there was/is nothing back home that I really want or need to escape from. I love the Bay and it will always be my home. Long Walk to Freedom was borderline life-changing! I can still remember going to see him speak in person at the Oakland Coliseum when he first got released from jail in 1990. I don't remember a damn thing he said, but I just remember how important it seemed to the tens of thousands of people around me, especially my dad. The whole time I was reading the book, I just kept on thinking how lucky the planet is to have him (still!). I want Magic Johnson to share some of his "Live Forever" pills with Mr. Mandela so he can stick around for another 100 years. It's long, but it's not hard or depressing, its the opposite. 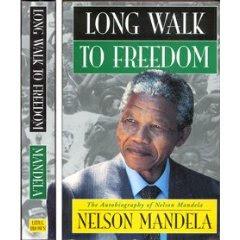 In many ways, Say You're One of Them is the polar opposite of Nelson Mandela's memoir. First of all, it is a collection of short stories, not one big undertaking. Second, it's fiction (but it's not at all). Third, it is very, very, tough on the spirit. Written by a Nigerian Jesuit Priest, Say You're One of Them is about the pure resilience of children in the midst of utter ugliness. Please read this book, but don't expect to be uplifted too much by it. As for Catching Fire, it definitely does not read like a textbook. It's kind of a blend of anthropology, gastronomy, and physiology... gastrophysiologicalanthroplogy? Wait, I think I found the topic for my Master's Thesis! Yesterday, I took a nice long walk to the next village, Barrigada, to check out Hafa Books. After trekking along the highway for a half-hour (walking is not very popular here), I reached the used bookseller, and started combing the aisles. I honed this skill spending countless hours (and paychecks) at Amoeba Records starting back in '96. Effective shopping at any used book or music store is like speed-reading with higher stakes. It's all about recognizing the little things that jump out at you... positioning yourself in relation to other crate diggers so that they end up in your wake, not the other way around... and yes, good old-fashioned patience and restraint. After a good 30 minutes of mining, I dropped my booty on the counter, only to be told that the closest ATM was just another 15 minutes down the road. No sweat, plus walking in the cool tropical rain is pretty damn refreshing. Later that day I was back on the couch with my newest (used) book, Guns, Germs, and Steel: The Fates of Human Societies by Jared Diamond. Aaaaah, just were I want to be. If you enjoy reading, or if you know how much I do, then you'll appreciate just how good this is for me. If you're not into reading, I will just have to quote Menace II Society by saying, "I fill sorry foh yoh muddah!" If any of these books jump out at you for any reason, leave a comment and let me know what's on your mind. Personally, I would recommend any and all of them, but I would point out that The Da Vinci Code is basically the same exact book as Angels & Demons, the first book in the series. I have the third book, The Lost Symbol, with me, but I'll probably have to wait awhile before I jump into that. I'll be updating this blog entry as I go with new titles as I finish them. I will also add some reflections on how the books relate to my experiences here. Please check back again soon! - Jan 18: I just finished Foundation and Earth, and after I turned the last page I threw the paperback against the wall on the far side of the room and yelled "rubbish!" 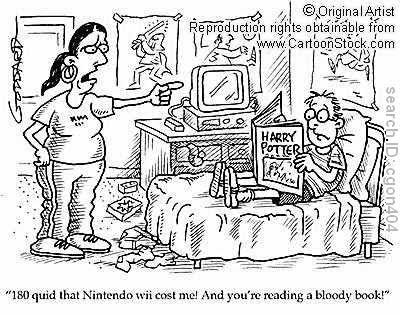 The last time I had that reaction was when I finished Roberto Bolaño's 2666. At least Foundation and Earth wasn't a thousand pages long, so I didn't take it so personally. Isaac Asimov's Prelude to Foundation was the book that first got me into reading, some time back in the early 90's. For me, that book ranks right up there with The Power of One (Courtenay), The Count of Monte Cristo (Dumas), and everything by Gabriel Garcia Marquez, as all-time favorites. Over the next few years I plowed through the next four books in the Foundation series, feeling like each book was not quite as good as the last. Eventually, I lost interest, until I saw the final book in the series on the shelf in a department store in Fiji. I guess I thought I owed it to old Isaac to finish what we started together so long ago. In the end, I would say Foundation and Earth is what happens when an author is under too long of a contract, and takes too much of his publisher's advice. Sorry Dr. Asimov, but the next sci-fi book I read will be by Frank Herbert. 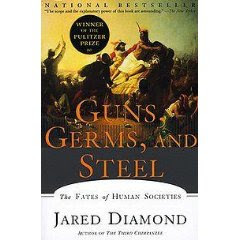 Guns Germs and Steel is one of those books that changed the way I entered the world and understood the world completley. The implications of what he is talking about blow my mind. It comes up in conversations for me more than any other book I can think of. The next one "Collapse" is the inverse and is really quite disturbing. yep...guns germs & steel is a great one. Check out "Power, Faith, and Fantasy: America in the Middle East: 1776 to the Present (Hardcover)"
..book begins w/ Thomas Jefferson and John Adams in europe to meet a head official of the then called 'barbary states' to try to forge some sort of peace between america and the muslim world...the sultan they meet hands them a koran..tells them this is a muslims bible..and in it it says we should convert you or chase you to the ends of the earth killing you off. The book gets into detail just how much of an early threat the arab states were to america & how the us navy was formed directly as a result of the arabs ability to sink and/or capture any ships sent over there & no peace aggreement was ever long lasting. 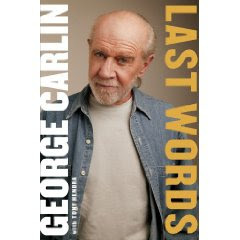 nice book list, great journey youre on man. Word... I actually read Collapse: How Societes Choose to Fail or Succeed" last year (or the year before? ), but I completely forgot it was by the same author until you pointed that out now! Gracias Colleen (and Suzanne). See you in Auckland! I just started reading "Confession of an Economic Hit Man" by John Perkins. I think it would be a good one to add to your list, especially based on the experiences you are having in Guam and support of the We are Guahan movement. Thanks for adding me to your blog list, super interested in hearing move about your trip! Ooh, I've heard that book is for real! I still haven't read it and I completely forgot about it until you brought it up. It's officially on the list now.